Yorkshire has a tradition of popping out some talented metal bands from the well known acts such as Saxon, My Dying Bride and Paradise Lost, to the lesser known bands such as Sworn Amongst, Lost Effect and Bal-Sagoth. Hailing from the western reaches of Yorkshire, from a town known as Wakefield, come modern metallers Hamerex who blast out with an old school twist on their music. The album opens up straight away with the title track IX Circles (the title sounding like a reference to the nine circles of Hell in Dante’s Divine Comedy). A cryptic use of whispering begins the track before leading in a repetitive riff. The song itself isn’t exactly inspiring, failing to entice with any sort of flavouring save a bland use of guitars and other instrumentation but it does give a small teaser of what’s to come. The Life Of Death marches in with a stronger style, taking on a Megadeth sounding fashion in the bass workings with a use of melodic guitars and typical NWOBHM vocals. Inferno carries on the subtle humming of melodic riffs with the bass ringing out more prominently. The throaty use of vocals doesn’t match up to the style of riffs during in the verses but goes down a treat throughout the chorus. Edge Of Madness belts out a stronger Megadeth sound than The Life Of Death, slipping in some pleasant licks in there. The flow of drums, back and forth, keep the song as fresh as bread that’s come straight out of the oven, allowing the guitars and bass to do their thing in an old school manner. 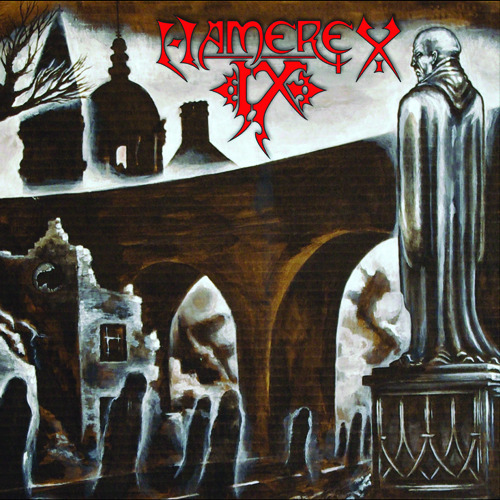 The Extremist is probably the most extreme track of the album, with the vocals nearly going through a metamorphosis into a raspy death metal style and the the riffs taking a turn down a road of heavier bombardment where as Mortuary goes down the highway of hard rock anthems, screaming with catchy passages and soaring vocal sections. The Stranger (Anyone else automatically think of Game of Thrones just then? No? Just me? Bugger.) isn’t quite as dusky as would be expected, parading strong NWOBHM elements and some vicious bites from the guitars. Descent Of Angels thrashes about, becoming as extreme as The Extremist and possessing an essence of Venom in the music. The Night Of Samhain differs from the rest of the album completely, easing its way in a combination of acoustic guitars and thundering yet distant bass workings. The hidden use of keyboards in the background add a certain atmospheric embrace to the song, gently dancing between the guitar and bass. The vocals sound their best throughout this song. The shifting phases of the track makes it easy to mistake it for multiple tracks, as opposed to one long epic. The album is finalised with the last track; Still The wall Remains. A gentle piece in its beginnings, with soft, harmonic vocals, the song does take a turn down a heavier route before going back to gentle sailing. The guitar solo is the highlight of the song though, adding some chaos to the harmony. Hamerex prove that Yorkshire’s metal scene is well and truly thriving. Whilst the album had a bumping start to its journey, it soon made up for it with the differing elements each member bring to the band and the music. From Megadeth sounding bass lines to roaring NWOBHMesque vocals and everything in between, IX is certainly one album to grab for the collection. This entry was posted on 12th November 2013 at 11:55 pm and is filed under CD, Metal with tags Bal-Sagoth, Dante, Divine Comedy, Hamerex, IX, Megadeth, my dying bride, New Wave of British Heavy Metal, Paradise Lost, Sworn Amongst, Wakefield, Yorkshire. You can follow any responses to this entry through the RSS 2.0 feed. You can leave a response, or trackback from your own site.